Winner at the Los Angeles Music Awards in November 2006, Mobetta Loretta received Folk Rock Artist of the Year for the song "Wish U Were Here." This singer/songwriter hailing from New Mexico is an authentic folk/blues/country/roots artist who takes you back to a time when music had feeling and depth. Armed with her guitar and a voice that evokes the sweet soulfulness of Emmylou Harris, Jewel and Fiona Apple, Loretta Chacon, A.K.A. Mobetta Loretta stirs and prods her listeners with lyrics kissed by life’s chapped lips. This is not background noise. This is a sound that tickles your ears, beguiling you like a mythical Siren to come a little closer until you look down and realize that you have been tied to the mast of fandom by her lyrics. Whether she is singing about the purity of childhood innocence (making mud pies and swinging on the swing set while yucca stalks, like soldiers, stand guard) or the realities of war (“ain’t good for nothing ‘cept for filling up a grave”), Mobetta Loretta seems familiar, telling us where we all have been, and like a sage, telling us where we should be headed; but, in a manner refreshingly not overwhelmed by self-importance. You should listen. Mobetta Loretta’s audience appeal has played to the tune of a wide array of audiences including, young and old, looking for honesty and sincerity in music. Her broad influences ranging from folk to country and jazz have shown a multi-faceted gem, with unique brilliance. "Salt of the Earth" Reviewed by RadioIndy.com! “Salt of the Earth,” Mobetta Loretta’s latest CD, would be best described as a modern folk album with a dash of southern rock. Yet it is much more than that because it is such an ambitious and creative work; it was recorded as a concept album with all the songs being inspired by the 1954 album also titled “Salt Of The Earth.” In “Copper Pit Miner,” Mobetta sings to us about being a copper miner in an upbeat, danceable folk-blues song that features great harmonica. “I Am the Salt of the Earth” is a song in which Mobetta opts to croon to us over a pleasant combination of acoustic guitar and string section. For “Local 809” she sings about antiquated union life over a more modern and toe-tapping blues beat. The songs on this album stand up on their own, as they are great contemporary expressions of a past generation; yet when one factors in that each song is part of an overall theme it really adds substance. 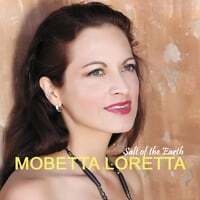 So check out Mobetta Loretta’s CD, “Salt of the Earth,” if you want to hear great folksy blues stories of a day gone by. RadioIndy created a CD Announcement Press Release for Mobetta Loretta on Digg.com! RadioIndy is pleased to announced that we have published our CD Review of Mobetta Loretta music to CD Baby. FANS - Please checkout BAND online!